No electromagnetic wave, and we can also add photons to this, can be broadcast in zero time. They certainly need a period of time to be broadcast. Moreover, electromagnetic waves have dimensions, too. In order to define an electromagnetic wave, we use its dimension, in other words, its wavelength. By making use of these two characteristics of electromagnetic waves, i.e. requiring time to be broadcast and their wavelengths, it is possible to reach the mathematical foundation of Doppler Shift. In this part here, I will show you the method of it. As can be seen in the figure, a plane broadcasts an electromagnetic wave when it is between Point A and B. Point A is the location when the plane started to broadcast the wave, and Point B is the location where the plane finished broadcasting the wave. Again, as we can see in the figure, the plane sends a single wavelength as the signal. A special Doppler Triangle has been used in the figure. Let’s say that the broadcast time of the signal that the plane broadcasts is "t0". We will use this t0 time to determine the side lengths of the Doppler Triangle. Firstly, let’s calculate the normal wavelength of the signal that is broadcast. 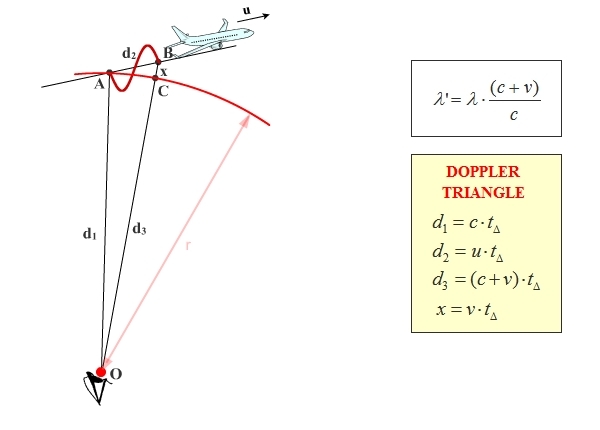 As the plane sends a single wavelength as the signal, we consider that the AO distance in the Doppler Triangle, i.e. the d1 distance, is equal to the wavelength. If the plane and the observer were motionless relative to each other, the observer would receive the whole signal wavelength in t0 time. But they are in motion relative to each other. In this case, how long did it take the observer to receive the whole signal wavelength? Here we reach the final result. While objects are moving away from each other, this equation shows the change on the wavelength. The calculations here are completely same as the ones that are done for (c+v). As the similarity is huge, I did not feel the need to write them here as well. However, the OB distance changed here. Because it is , the plus signs are replaced with minuses in relevant parts in the following calculations. 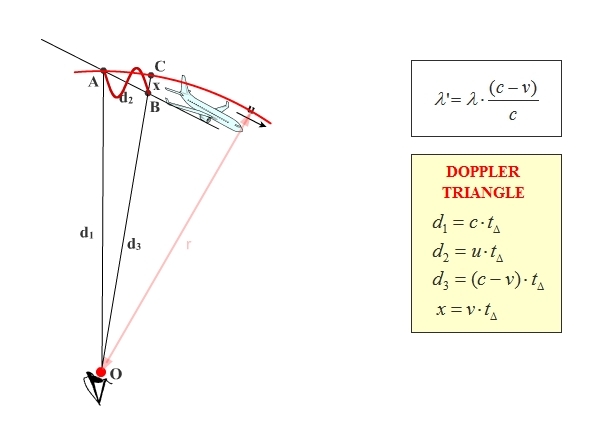 When the values are placed in the relevant parts by making use of the Doppler Triangle, the result is obtained. From here, the final result that shows the wavelength change between the objects that are approaching each other. What is Relativistic Doppler Shift? I felt the necessity to touch upon this topic here. As a consequence of the Relativity Theory, there are many artificially-created equations that have been placed in physics and used up to now. The Relativistic Doppler equation is one of these. Relativistic Doppler is a made-up term that is a product of imagination, and it has no ties with reality. Alice Law eliminated both the Relativity Theory and the term Relativistic Doppler, which is a consequence of the theory.